Another Silver Palate favorite, good year-round, but essential on Valentine's Day. Cream the butter and confectioner's sugar together until light. Sift the flour and salt together and add to the creamed mixture. Add the vanilla and blend thoroughly. Gather the dough into a ball, wrap in waxed paper, and chill for 4 to 6 hours. Roll out the chilled dough to a thickness of ⅜ inch. 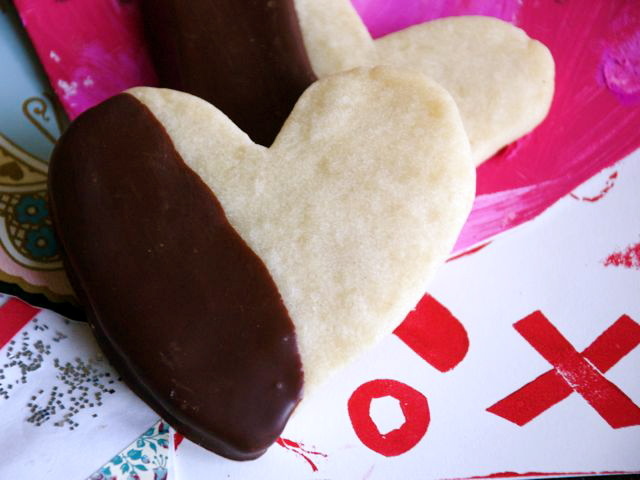 Using a 3-inch-long heart-shaped cookie cutter, cut out cookies. Sprinkle the tops with granulated sugar. Place the cut-out cookies on ungreased cookie sheets and refrigerate 45 minutes before baking. Preheat the oven to 375 degrees. Bake the cookies for 20 minutes, or until they are just starting to color lightly; cookies should not brown at all. Cool on a rack. Culinate editor's note: You can melt any kind of chocolate in the microwave or a double boiler. Once it is melted, dip one edge of a cooled shortbread heart into the chocolate, gently pressing a third of the cookie face into the chocolate, then lift up, allowing the chocolate to fill in the area.